Ideally, packaging solution for loose gemstones should combine portability and function. It should be lightweight and compact and protect the stones. Stones should be arranged in a face-up position for easy viewing and should lie in separate compartments to avoid chipping each other. Organized this way, the stones are ready to view and can be safely stored or transported at any time. 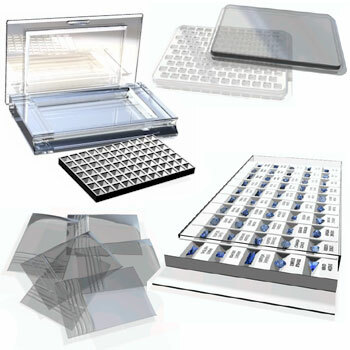 Diamond Tech gemstones packaging solutions include, plastic bags in all sizes, stone papers, bubble boxes, padded velcro boxes, slim packs, and slide packs. There are 34 products organized in 1 product line in the gemstone packaging category to choose from. Packaging plays and important role in the presentation, transportation, and storage of loose gemstones. For fixed displays, wooden, velvet, leather or chamois boxes are often the most attractive choice. Some of the styles look great and work well in stores but, they are often too bulky to transport economically. When transportation and storage space are issues, more compact options need to be considered. Wholesalers that carry hundreds or thousands of stones are well aware of the increased expenses associated high-value shipping as well as the issues of portability and secure storage.